A little bit of water can cause a lot of damage. That’s why it’s important to give your home’s plumbing a thorough check on a regular basis. In addition to checking for faucets that drip and pipes that leak, you should also look for condensation (or “sweating”) on cold water pipes. Sweating pipes happen when moist, humid air in your home is warmer than cold pipes. While this might seem like a minor problem, even small amounts of water can cause structural damage and promote the growth of mold and mildew. If you notice condensation or “sweating” on cold water pipes, installing pipe insulation is a quick and easy DIY project that will fix the problem. 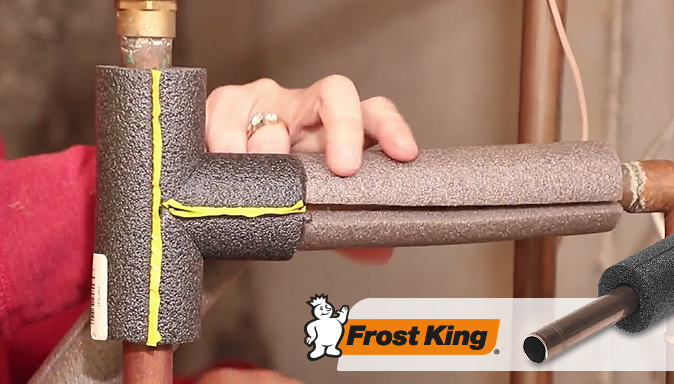 Frost King makes self-sealing Tubular Foam and Rubber Pipe Insulation that slips over pipes quickly and easily. You just cut them to the right length and slide them into place, then press the adhesive-coated ends together for a tight seal. Use the pipe insulation with our pre-formed Tee and Elbow connections to make the job a lot easier.